This interesting and unusual surname is of English and Scottish locational origin, from Hardgate, a hamlet in the West Riding of Yorkshire, part of Faifley in Dunbartonshire and a village in Kirkcudbrightshire. The first element of the name may derive from either the Old Norse personal name "Higrtr" or the Old Norse "harthr" meaning difficult or inaccessible plus the second element "gata" a road; hence "Higrtr's road" or "the inaccessible road". The surname first appears on record in the latter half of the 14th Century, (see below). In the modern idiom the name is also found as Hargate and Hargitt. 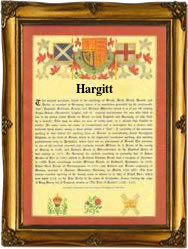 Early recordings of the surname from the Halifax church registers, in Yorkshire, include; George, son of Michaell Harget, who was christened on April 30th 1581; the marriage of Agnes Harget to George Fairbanks, on August 14th 1581; on November 7th 1585, Barbarye, daughter of George and Grace Harget was christened; Jonas Harget, who married Sara Michel on February 14th 1621. The first recorded spelling of the family name is shown to be that of Johannes Hardgate, which was dated 1379, in the Poll Tax Returns of Yorkshire, during the reign of King Richard 11, known as "Richard of Bordeaux", 1377 - 1399. Surnames became necessary when governments introduced personal taxation. In England this was known as Poll Tax. Throughout the centuries, surnames in every country have continued to "develop" often leading to astonishing variants of the original spelling.